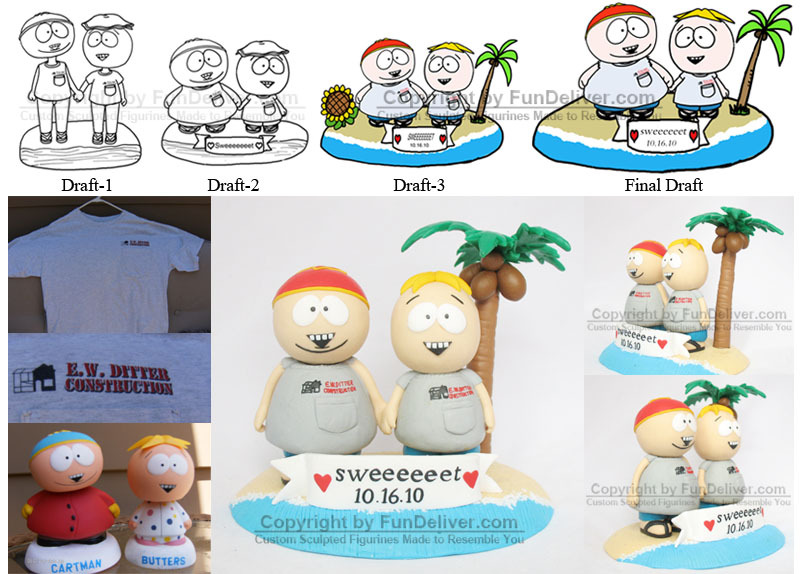 Here we are going to share a cute South Park Character Cartman & Butters wedding cake topper ordered by one of our customers. Specifically, she would like a cake topper made to resemble the characters from the animated television show South Park. There are 2 animated characters, Cartman (Groom) and Butters (Bride). They would like the topper to depict the animated characters as they are, with no likeness of them. She also doesn't want them to be wearing wedding "attire", as they are both actually of the male gender, so it would be weird. (It's an inside joke...long story!) She would like them to wear matching shirts as above image. It is VERY important the t-shirt be light grey, that there is a pocket on the t-shirt, and that the logo (including the wording E.W. Ditter Construction) is included on the t-shirt above the pocket and in the correct colors. She really wants Cartman’s t-shirt to look as if the sleeves have been "torn" off. It's kind of a joke, but makes an important statement on her topper. On the base, they would like a ribbon, or something similar, with the word "Sweeeeeeet" written on it with hearts at the end. (It's something Cartman always says). I just wanted you to know that my cake topper just arrived, and I am SO happy with how it looks! You guys did an awesome job, and you were so patient and accommodating. Thank you again for making this stress-free for me...I have enough to stress about planning a wedding!! !